Immunity is the body’s defense system against infection and disease. White blood cells play a key role. Some rush to attack any harmful microbes that invade the body. Other white blood cells become specialists, adapted to fight particular pathogens. All of them work to keep the body as healthy as possible. White blood cells, also called leukocytes, defend the body against disease. They normally account for only 1% of circulating blood volume but increase during infection or inflammation. Neutrophils are the most common type, comprising 60% to 70% of all white blood cells. Neutrophils are phagocytes, cells that consume invading pathogens. Lymphocytes, the second most common type of white blood cell, disseminate through the organs and tissues of the lymphatic system. 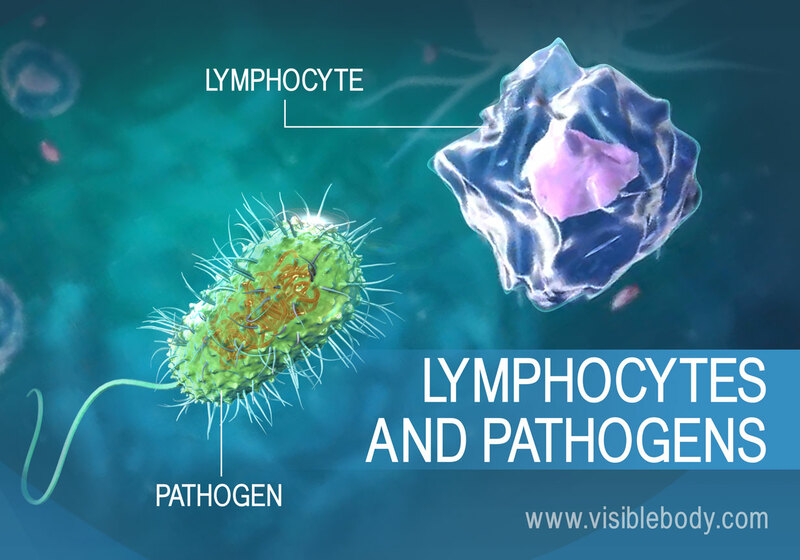 Lymphocytes target specific pathogens as part of the immune response. 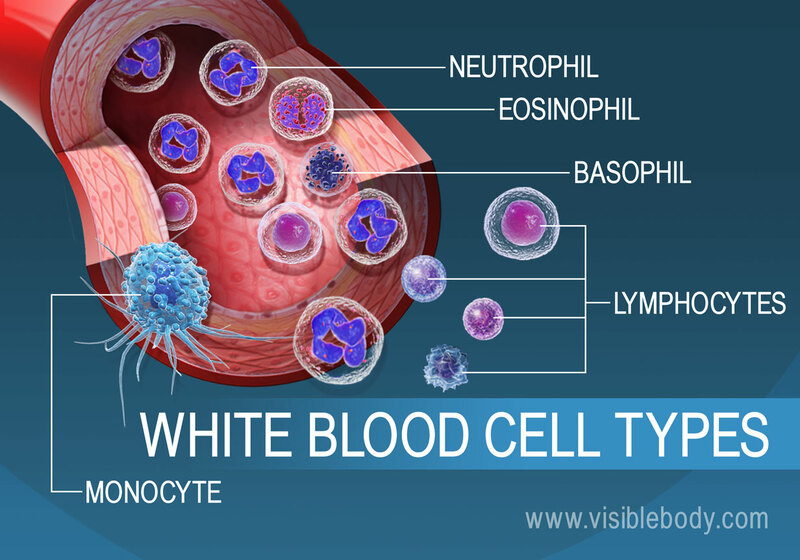 Other white blood cells include eosinophils, basophils, and monocytes. Phagocytes are a group of white blood cells that includes neutrophils. These cells consume bacteria and other pathogens to protect the body from infection. The process begins when chemicals from a pathogen, or damaged tissue, attract a phagocyte. The phagocyte binds to the microbe, envelopes it, and then eats it. Enzymes within the phagocyte kill and digest the pathogen. This action is called phagocytosis. 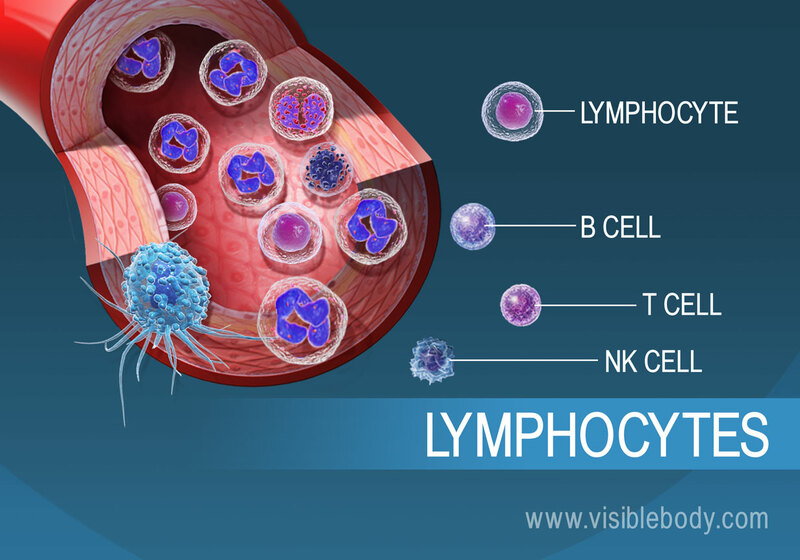 Lymphocytes are a type of white blood cell produced in red bone marrow that multiplies in the lymphatic system. They can travel through the lymphatic and circulatory systems. Lymphocytes include several sub-types: B cells produce antibodies. T cells target virus or fungal-infected cells, cancer cells, and transplanted cells. Natural killer (NK) cells attack and destroy foreign microbes. 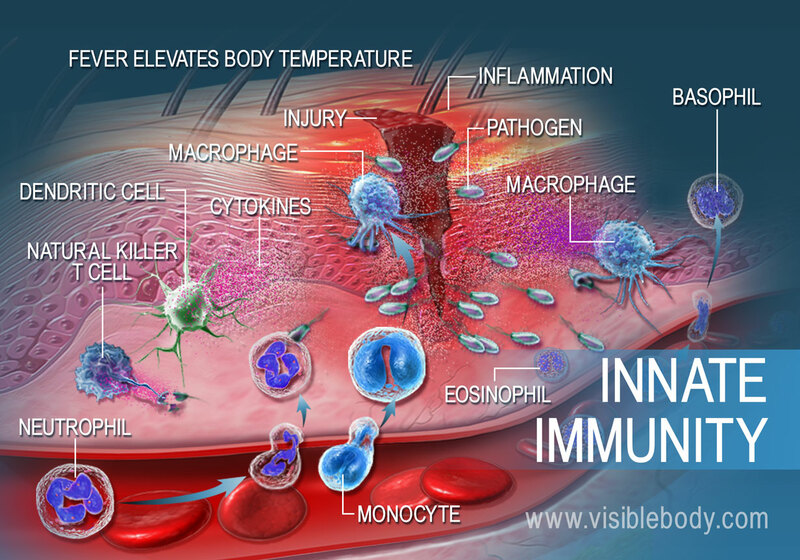 All of these lymphocyte cells contribute to the body’s immune response. When an infection occurs, fever elevates body temperature to accelerate the immune response. The reaction can happen relatively quickly. Blood vessels dilate around the injury site, inflaming the area. 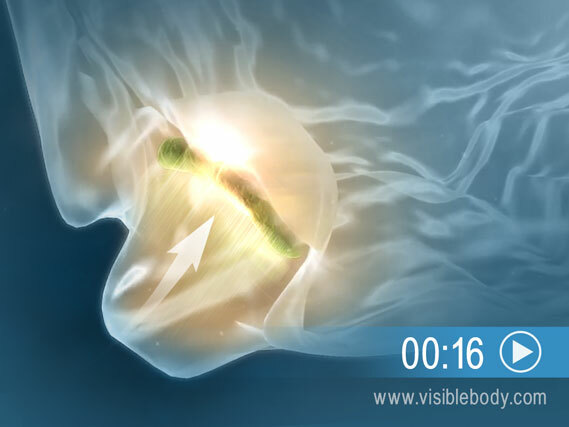 The vessel dilation allows more white blood cells to leave the bloodstream and enter the infected tissues. Phagocytes then do the job of consuming invading microbes. This rapid response by the body to an infection is an example of innate immunity. Activated B cells multiply to produce large numbers of clones, most of which become plasma cells. Plasma cells produce antibodies that recognize antigens on foreign microbes. The antibodies act as tags to identify the invaders. This is called an antibody-mediated response. T cells, activated by antigens presented by phagocytes, multiply then seek out and destroy infected cells. This is called a cell-mediated response. A few of the B cell and T cell clones are modified to populate lymph organs so that they can respond quickly in the future if the pathogen returns. In this way, the adaptive immune system "remembers" the pathogen involved. 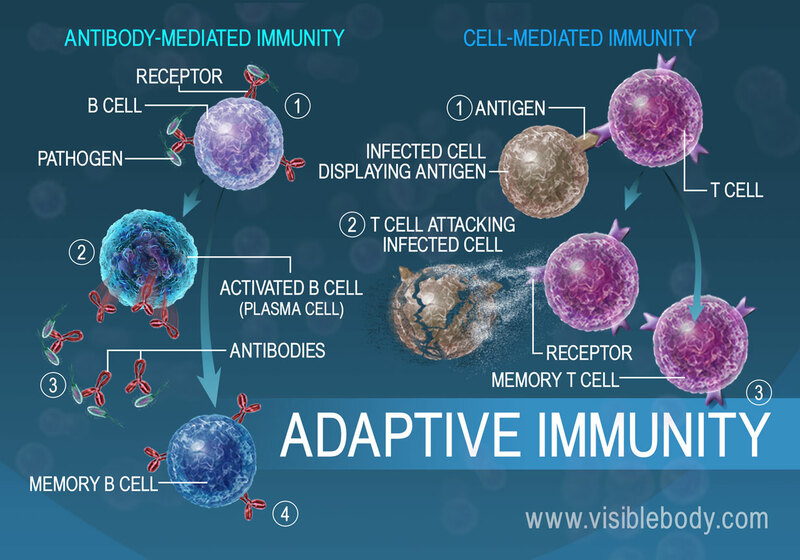 The entire process, in which the response to particular pathogens modifies certain B cells and T cells, is called adaptive immunity. Study: The body’s immune system response was enhanced when researchers disrupted a protein that prevents the immune system from overreacting. From Science Daily. Learn about boosting the immune system from Harvard Health Publications and Harvard Medical School.